Peter Alves (1863-1939) was born in Louisiana on December 11, 1863, the son of Peter Alves and Elizabeth Supass. He married Angelina Trasierra (1876-1957), the daughter of Manuel Trasierra and Emily Numberg (1848-1924) at New Orleans on June 22, 1891. Angelina was born at New Orleans and her parents were from Mexico and Texas respectively. Their children were: August George Alves (1893-1959), Charles Alves(1896-1971), Jennie Alves Tillman (1898-1980), Bertha Alves Gerosa Churchill Thomas (1901?-1980+), Joseph Alves (1903-1953), Alma Alves Olier (1907-1987), and Wilhemina Alves West(1910-2005). The Peter Alves family arrived at Biloxi circa 1910, probably from New Orleans. In 1920, Peter Alves was sick and not working. Angelina was an oyster shucker in a canning plant. They lived on Myrtle Street at Point Cadet in a domicile adjacent to the Joseph A. Toche (1872-1960) family. August George Alves (1893-1959) was born December 23, 1893. He married Lola Daniels (1898-1940). Children: August G. Alves II (1915-1979), Lola Claire Alves (1918-1919), Joyce Alves Nocora, and Rita Alves Oliver. He died on March 15, 1959 while she expired on November 11, 1940. Buried Biloxi City Cemetery. August G. “Ducky” Alves II (1915-1979) married Phala Louise Vierling (1921-1978). Their children: August G. Alves III, Kay A. Braun DeSilvey, and Kevin Alves. In 1958, August G. Alves is making his livelihood as a ship captain and living at 120 West End Homes in Biloxi. August George Alves III [1938-2018] expired on 5 November 2018. Appointed police chief in 1983 and served in this capacity until 1989. 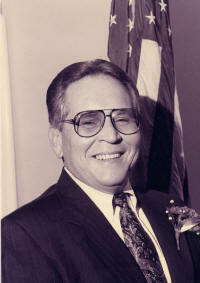 Elected Mayor of Ocean Springs in 1989 and 1993. Kevin Vincent Alves married Lynn Belle Speed (b. 1950), the daughter of Alfred Speed and Irene Martin, in August 1968. Rita married William Oliver. They had a daughter, Chi Chi Joyce Oliver (1940-1940) who expired as an infant on May 23, 1940. Buried Biloxi City Cemetery. Joseph “Joe” Alves (1903-1953) was born at New Orleans. He married Mable Marie Tauzin (1907-2004), a native of New Iberia, Louisiana, and the daughter of Emile Tauzin and Angela Borrell. (HARCO, Ms. MRB 36, p. 35). Helen Alves married Wadja. Children: Anthony, John, Eugene, Jeanne W. Dykraff. Alma Alves (1907-1987) was born July 8, 1907. She married Voorhis Louis Olier. They had a son, Voorhis L. Olier II (1928-1948), who died on April 25, 1948. Alma expired in September 1987. The Daily Herald, “New damage suits are filed”, February 17, 1917. The Daily Herald, “Court takes adjourment”, May 12, 1918. The Daily Herald, “Damage suits in Circuit Court”, November 27, 1917. The Daily Herald, “Peter Alves given verdict for $2500”, November 28, 1917. The Daily Herald, “Motions granted for new trials”, December 17, 1917. The Daily Herald, “Sad occurrence in early morning", October 11, 1919. The Daily Herald, “Biloxi Youth Wins His Suit”, February 26, 1918. The Daily Herald, “Churchill-Gerosa”, December 21, 1921. The Daily Herald, “Fisherman Dies Suddenly”, May 16, 1931. The Daily Herald, “Alves-Kelty”, January 17, 1949. The Daily Herald, “Miss Mona Alves”, June 29, 1950. The Daily Herald, “Charles Pete Alves”, August 1, 1971. The Daily Herald, “Raphael P. Alves”, September 2, 1988. The Daily Herald, “Mrs. Jennie A. Tillman”, January 28, 1980. The Daily Herald, “Henry G. ‘Bubba’ Alves”, November 14, 1992. The Ocean Springs News, “Jennie Alves Tillman”, January 1980. The Ocean Springs Record, “Williams and Alves honored by VFW", May 6, 1976, p. 14. The Ocean Springs Record, “Alves Named Ocean Springs Chief of Police”, February 10, 1983. The Ocean Springs Record, “New chief assumes duties”, February 17, 1983. The Ocean Springs Record, “First Family”, June 22, 1989. The Ocean Springs Record, “Alves-Williams", October 28, 2004, p. A6. The Sun Herald, “Mabel Marie Tauzin”, May 29, 2004. The Sun Herald, "Mrs. Wilhemina West", October 4, 2005, p. A6. The Sun Herald, "Alfred Luke Speed", November 22, 1997. The Sun Herald, "Irene Martin Speed", November 28, 2013.